DUMBARTON were chasing shadows — and not catching them — as they endured a 6-0 rout from back to form Queen of the South at sunlit Palmerston Park. DUMBARTON were chasing shadows — and not catching them — as they endured a 6-0 rout from back to form Queen of the South in front a 1,459 crowd at sunlit Palmerston Park. Stevie Aitken's men produced their poorest performance of an up and down season and were totally outfought and outplayed by the men in blue, to the astonishment of their travelling support. The home side struck the post early on and went one up on 34 minutes when central defender Darren Brownlie drove home from a loosely defended corner. Top scorer Derek Lyle made it 2-0 just before half time, curling the ball home from a central position following a goalmouth scramble. The pattern continued after the break — but got worse. On 52 minutes Lyle scored his second and his side's third to put the result effectively beyond doubt. Alex Harris added to Sons woes on 69 minutes, putting a perfectly placed low shot beyond the reach of keeper Jamie Ewings for 4-0. Four minutes later Harris claimed his brace as Queens went nap, and the misery was complete when ex-Son Iain Russell angled the ball in for a comprehensive 6-0 victory. 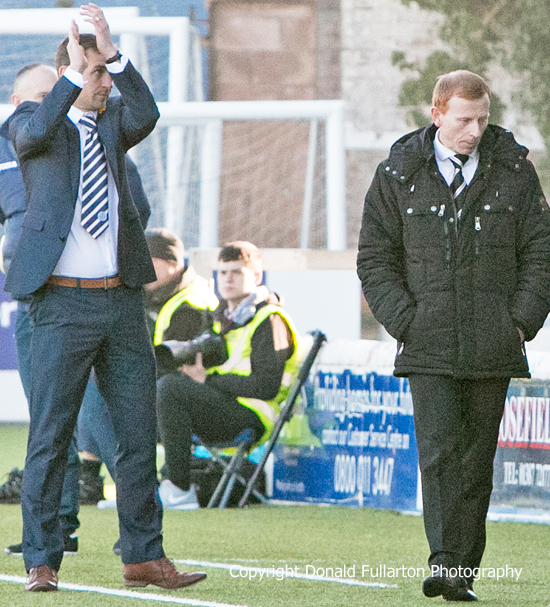 The picture shows contrasting emotions at full time for managers James Fowler and Stevie Aitken.